Highland Avenue meanders along the north slopes of Birmingham’s Red Mountain for a couple of basically east-west miles. 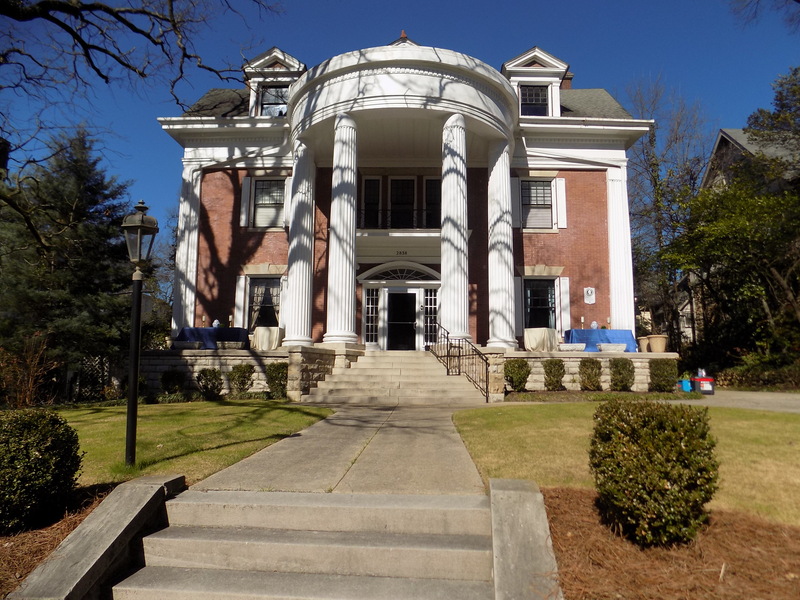 It starts at the business end of the Five Points South community and ends at Clairmont Avenue in Lakeview, beside the Highland Park Golf Course. The area around Highland has always struck me as the epitome of a great urban neighborhood. 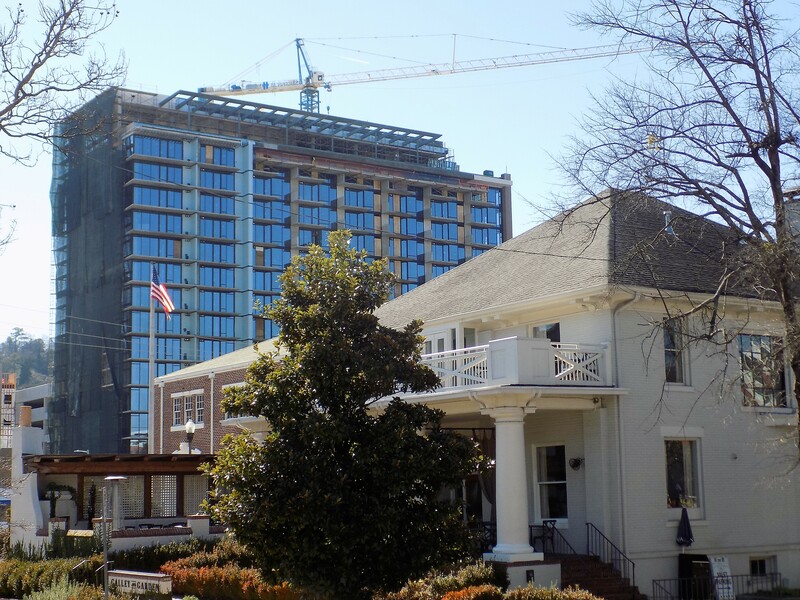 By the 1960s, many of Highland’s grand houses had been split up into apartments, but now, many of those houses have given way to new development while others have mostly returned back to single family dwellings or event venues. What once were trolley tracks are now well-planted raised beds which run down the middle of most of the drive. 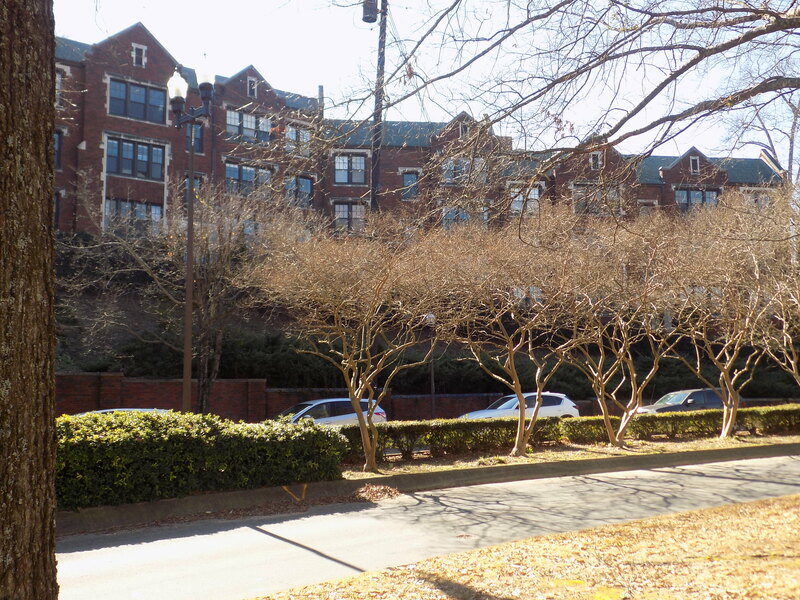 Highland Avenue was conceived as a main thoroughfare through real estate development in the town of Highland before the town was annexed into the city of Birmingham. Nowadays, the area is a mix of commercial and residential with high-rise apartments and condominiums among the houses and townhouses. It’s a surprisingly charming architectural mix with late nineteenth and early twentieth century architecture co-existing comfortably with contemporary high-rises. Three cozy parks – for relaxing, playing with dogs, or shooting baskets – provide respite among the bustle of the avenue’s traffic. The street has a casually elegant feel – a mixture of contemporary with doses of a more elegant time past; it’s still easy to imagine trolleys and carriages moving along the avenue, and people leaving their calling cards at houses during Sunday strolls. The last time I lived in Birmingham, my apartment was up Red Mountain from Highland and the area was a regular walking spot for me. 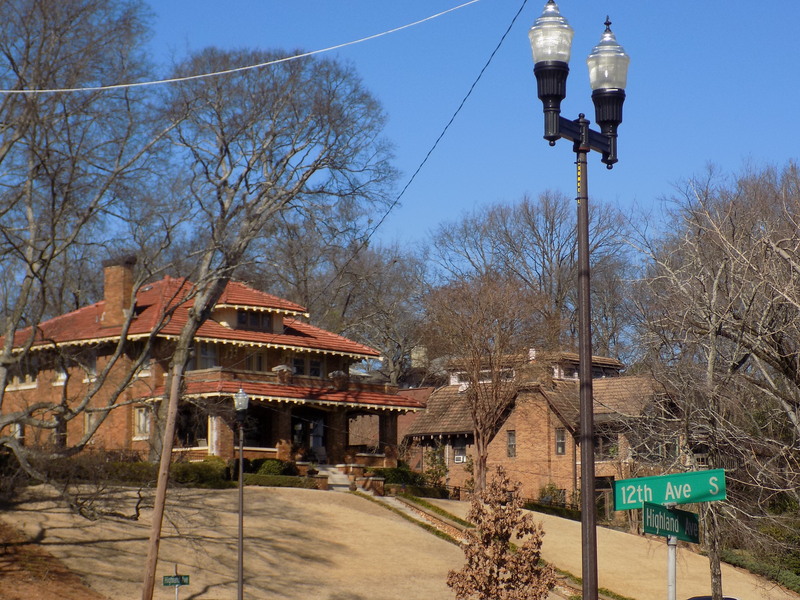 The neighborhood always relaxes and inspires me with occasional glimpses north to the Birmingham skyline, a sighting of Vulcan to the southwest, or the grand houses of the Redmont neighborhood along the Red Mountain crest. If I am anywhere near the area, I will usually take a quick detour over to Highland rather than a more direct route. A long-gone Birmingham-based chain of cafeterias called Britling had locations throughout the city, but I always thought the Highland Avenue location, which was known as “Britling on the Highlands,” somehow stood apart from the rest. That “on the Highlands” tag gave it a sense of elegance to my young mind. 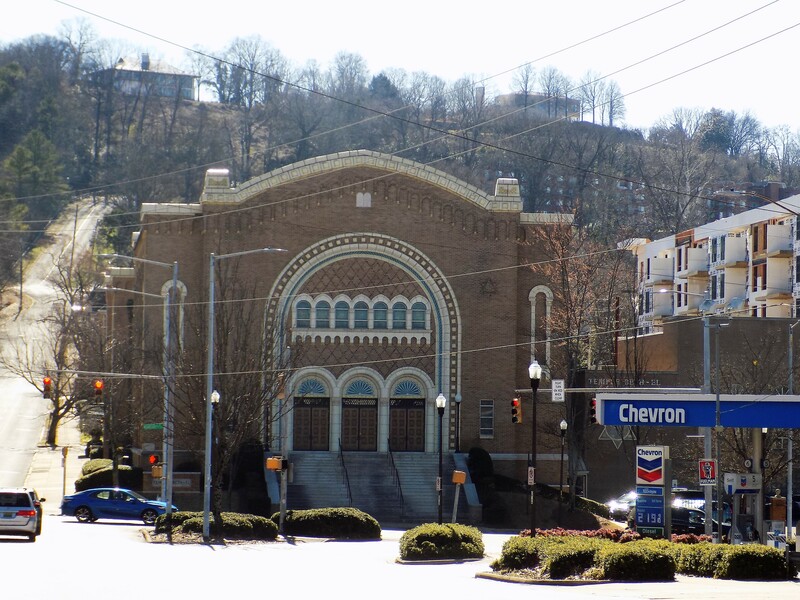 Impressive houses of worship are scattered along Highland Avenue. Temple Beth-El and Temple Emanu-El are just a couple of blocks apart. 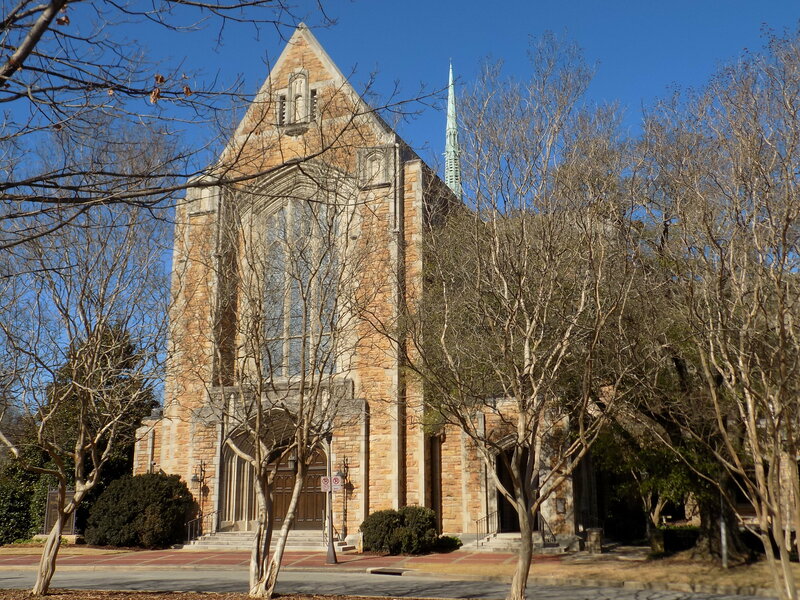 South Highland Presbyterian Church is located near the west end of the avenue and the neo-Gothic Independent Presbyterian Church is situated near the east end, across from the golf course. 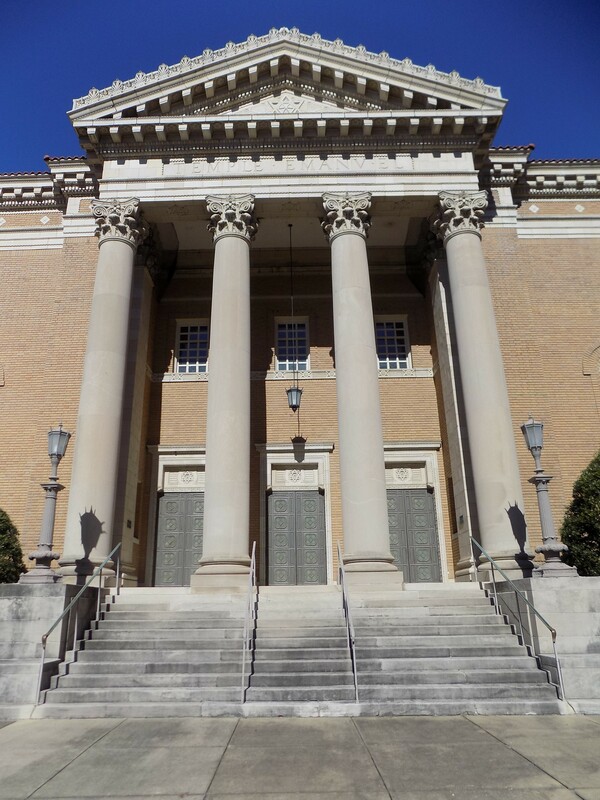 The two Presbyterian churches started out as South Highlands; Independent formed after a doctrinal split in the early 1900s. Chef Frank Stitt’s Bottega and Bottega Café, his Italian-inspired dining spots, are housed right on the avenue in the Bottega Favorita building, a limestone charmer with visual as well as culinary distinction. Other notable restaurants along the avenue are Galley & Garden in the old Merritt House, and Hot & Hot Fish Club, half a block down and behind Highland Plaza, an art deco shopping center anchored by locally-owned Western Supermarket. Stitt’s Highlands Bar and Grill, 2018’s James Beard Award winner for Most Outstanding Restaurant in America, is located just a couple of blocks from Highland Avenue, in Five Points South. I was saddened to learn recently that Western Supermarkets are going out of business after over seventy years. The Western on Highland was the closest grocery store to my Southside apartment in the ‘90s – and the only grocery store near downtown at the time. I frequently stopped there on the way home from work and often walked down early on Sunday mornings to pick up the Birmingham News and New York Times. 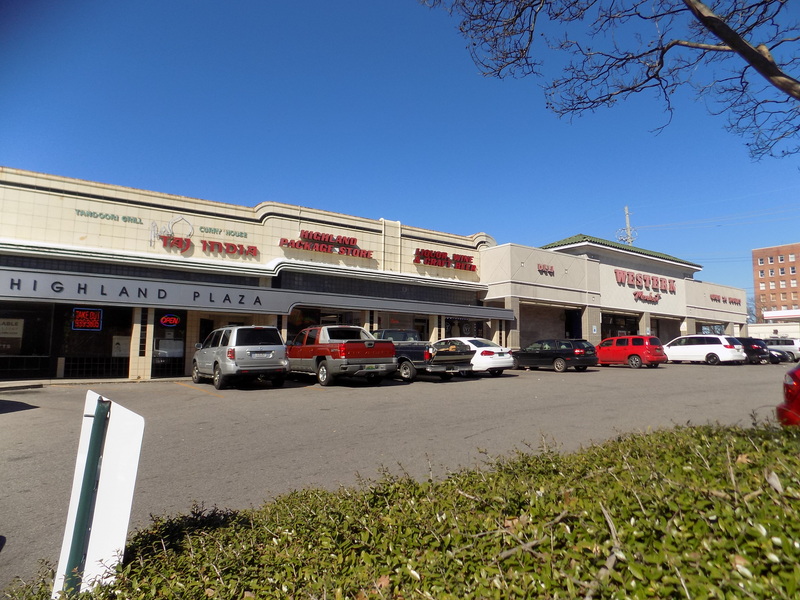 The closing of the supermarket coincides with the purchase of Highland Plaza by a developer, with rumors of a major overhaul and redevelopment of the site in the works – another beloved landmark that will soon bite the dust. Traveling past the Highland Plaza toward Temple Beth-El used to be one of my favorite quick glimpses of the Vulcan statue overlooking the city. That particular vista is gone forever with the construction of the high-rise Vesta apartment complex now obscuring the view. The former Town and Gown Theatre is nestled just off Caldwell Park, which also used to be the front yard of sorts for John Carroll High School. John Carroll has moved to the suburbs, making way for more house construction, and Town and Gown has morphed into Virginia Samford Theatre, still a destination in the city for theatre-goers. I still have fond memories of auditioning for a juvenile role in a Steve McQueen movie at the old Town and Gown in the 1960s. 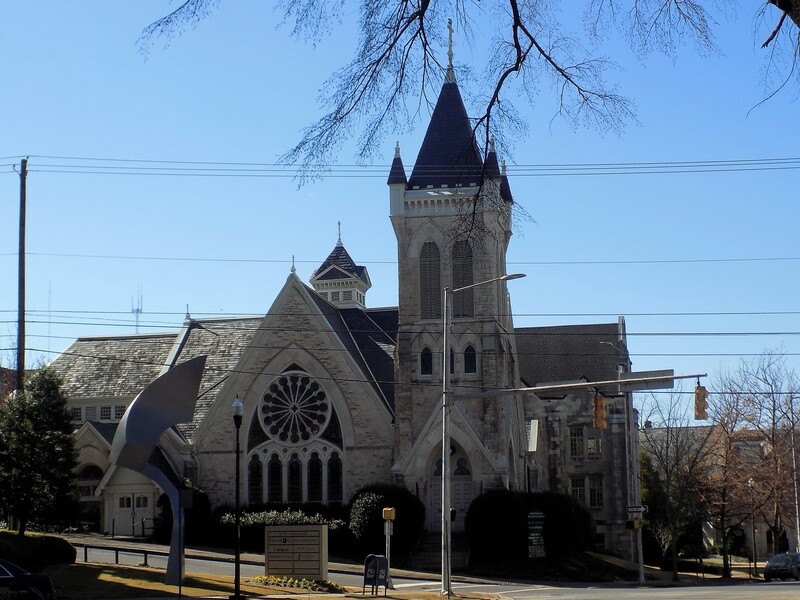 Despite considerable changes – and more to come – Highland Avenue retains its character and still feels like a neighborhood, a calm and shady retreat from the city center only a couple of miles away. It’s still one of my favorite streets to drive. 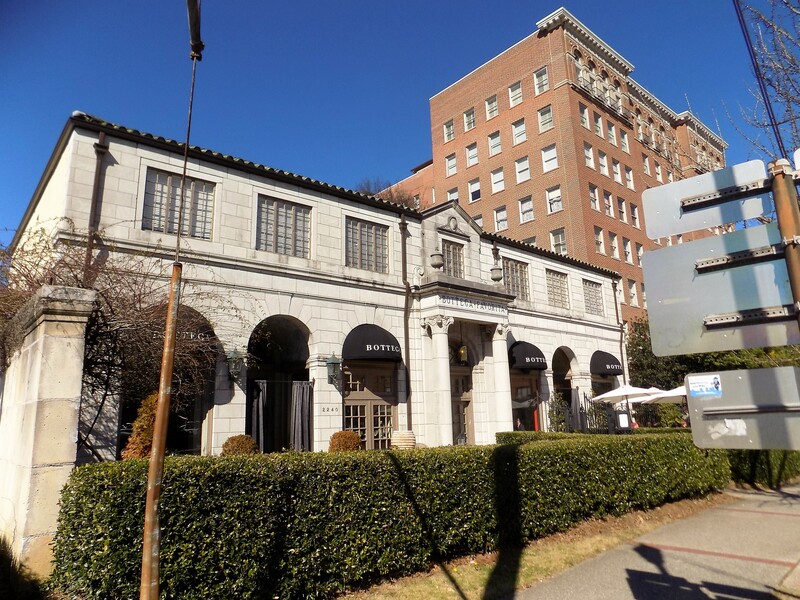 This entry was posted in Highland Avenue Birmingham and tagged Alabama, Birmingham, Bottega Cafe, Bottega Restaurant, Britling on the Highlands, Chef Frank Stitt, Highland Avenue, Highland Plaza, Highlands Bar and Grill, Independent Presbyterian Church, South Highland Presbyterian Church, Temple Beth-El, Temple Emanu-El, travel, Western Supermarket on February 7, 2019 by gedwardjourney.